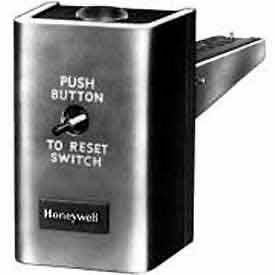 Honeywell Flame Protection Controls Provides Safety, Functional Capability And Features Beyond Conventional Controls. Flame Detectors And Amplifiers Work Together For Heating System Efficiency. Programmers And Primary Controls Are Used For A Variety Of Burner Control Operations. 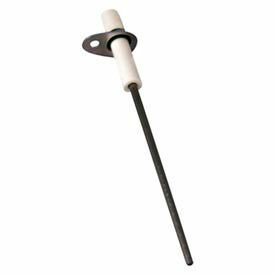 Igniters Are Available For Various Heating Applications. Igniters are solidly manufactured for long lasting durability and dependability. Supco® and White-Rodgers™ brand igniters and kits are available for a wide range of heating applications and equipment such as furnaces, boilers, rooftops, unit heaters, water heaters, swimming pool heaters and more. Include Universal Round or Flat Silicone Carbide Igniters, Universal Igniter and Flame Rod Assembly, Hot Surface Igniters and Universal Silicone Nitride Igniter, Mini and Upgrade Kit. 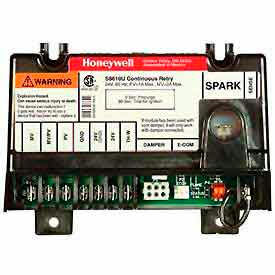 Honeywell Direct Spark Ignition Control Modules Provide Electronic Control Of Hot Surface/Direct Spark Ignition Systems. Used for use on gas fire furnaces, boilers and other heating appliances. Locks out after one trial for ignition if main burner fails to ignite. Reset from thermostat after lockout. S87 Models feature internal high voltage spark generators. S89 Models feature external spark transformers. Supco Replacement Furnace Igniters Are Used For Providing Dependable Ignition In All Heating Applications. Supco Replacement Furnace Igniters are made of a silicon carbide composition for long lasting durability. Use in furnaces, boilers, rooftops, unit heaters, water heaters, swimming pool heaters and other types of heating equipment. Variety of replacement types are available. Package quantity is 1. Sizes vary per type. Honeywell Pilot Burners Provide A Flame For Ignition Of Main Burner Gas Systems. 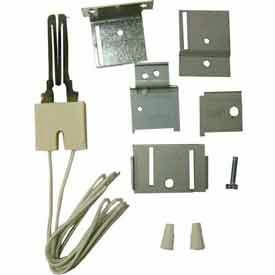 Pilot burners come with a wide variety of mounting brackets and tip styles for ease of installation and replacement. Q314 Series consists of non-primary, aerated, insert orifice type pilot burners for main burner ignitions. Q345 Series Burners are non-primary, aerated combination pilot burners and igniters. Q3450 Series Burners are SmartValve™ System pilot burners that provide pilot flame ignition and sensing for SV9500/SV9600 Systems. Q327 Burners are primary-aerated, spud orifice type pilot burners for main burner ignitions. Q3400A Igniter-Flame Rod Assembly replaces the original igniter-flame rod assembly in the Q3450 and Q3480 Pilot Hardware used with the SV9500 and SV9600 SmartValve™ System. Q3200U Universal Hot Surface Igniter Kit is a robust field service replacement igniter in gas fired appliances with Norton/St Gobain 120 VAC silicon carbide hot surface igniters. White-Rodgers™ Mercury Flame Sensors May Be Used With Natural, Manufactured Or Mixed Gases. White-Rodgers™ Mercury Flame Sensors combine a rugged Snap-Action SPDT switch with a powerful, mercury actuated, thermal element for accuracy and long lasting durability. The plug-in feature requires no additional electrical connections or mounting devices. Sensors are recycling type, which require relighting or possible restoration of proper gas pressure in order to return to operation. Width is 1-1/2 in., height is 1-1/2 in. and diameter is 2 in. Element length is 48 in. 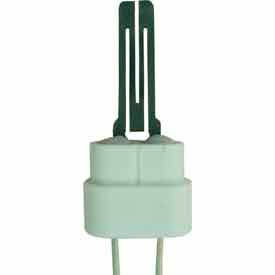 Choose from 3 Pin Plug or One Pin And Two Spade terminals. Ignition Control Units Provide Operating Control And System Shutdown On Loss of Main Burner Flame In Central Heat Furnaces And Heating Appliances. Ignition Control Units are solidly manufactured for long lasting durability and dependability. Various universal Honeywell and White-Rodgers™ brand units are available for Natural or LP gas applications. Include Hot Surface Ignition Controls, Pilot Relite Control and Integrated Ignition Controls. Lockout timings vary from 4 to 45 seconds. One Or Two Rod Intermittent Pilot Control 15 Or 90 Seconds Provides Electronic Control Of Most Intermittent Pilot Ignition Systems Used On Gas-Fired Furnaces, Boilers And Other Heating Appliances. One Or Two Rod Intermittent Pilot Control 15 Or 90 Seconds are constructed with high quality materials for long lasting durability. Provides continuous retry trial time with configurable lockout timing of 15 or 90 seconds and configurable prepurge of 30 seconds or no prepurge. 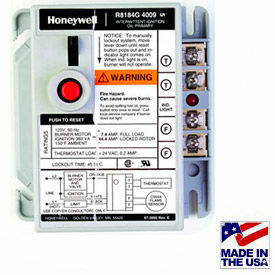 Field service replacement for most Honeywell, Robertshaw, Johnson, and UTEC (HSC) Intermittent Pilot Ignition Modules. Provides ignition sequence, flame monitoring and safety shutoff for intermittent pilot central furnaces and heating appliances. Offers 100 percent pilot gas shutoff if pilot fails to light; after 6-minute delay, trial for ignition is repeated. Ignition trial/delay sequence is repeated until appliance lights or call for heat is removed. Includes spark cable adapters to allow field replacement of both Honeywell and competitive controls without replacing existing spark cable. Gas type applications are Natural or LP gas. Dimensions are 3-15/16 in. H x 5-7/16 in. W x 2-5/8 in. D. For use with VR8204 AND VR8304. Packard® Flame Sensors Enable Optimized Flame Sense Current And Are Essential For The Efficient Operation Of Commercial And Industrial Hot Surface Ignition (HSI) Systems. Packard® Flame Sensors for Hot Surface Ignition Systems utilize teflon-insulated lead wire rated up to 250°C (482°F) as the mechanism by which the system senses burning flame. They consist of a single rod and can be mounted on any surface next to the flame being sensed. The rod connects to a small plated steel mounting bracket with single-screw installation. At a weight of 1lb and a 3-inch probe length, the sensor can be installed in tight areas for use in a wide variety of commercial and industrial applications. 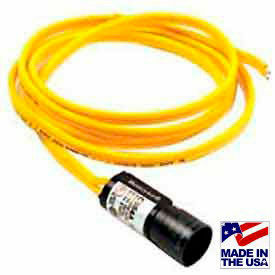 The Packard® Flame Sensor has a female connection with a standard size of 1/4". Manufacturers use machines equipped with Packard® HSI Flame Sensors every day to efficiently produce an adjustable level of surface heat. 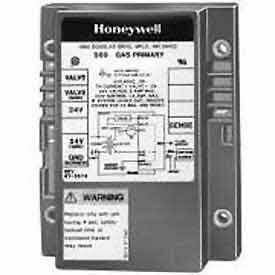 Honeywell Gas Limit Controls Are Used For Use As A Fire Thermostat In The Duct Work Of Air Conditioning And Ventilation Systems. Opens a line or low voltage circuit if the air temperature reaches a critical level at the controller location. If the circulated air reaches a temperature indicative of fire, the limit control shuts off the fan, preventing the fan from contributing to the spread of fire. 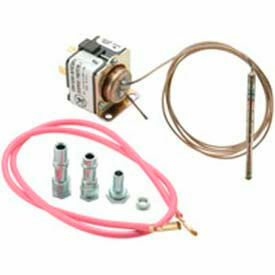 Also suitable for use with any warm air furnace to provide positive lockout of the burner in the event of fan failure. 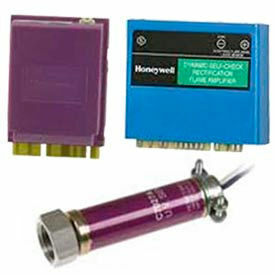 Honeywell Cadmium-Sulfide Photoconductive Flame Detectors Sense Flames In Sequencing Oil Burner Systems To Provide A Faster Response Than Bimetal Sensors. On flame failure, the light sensitive cadmium sulfide cell, in conjunction with flame sensing circuitry, causes the Protectorelay® control to shutdown the main oil burner. Entire plug-in cell is hermetically sealed (glass to metal) to reduce cell deterioration by humidity, soot or oil fumes. Model C554A1463 includes 2 flag 1/4" quick connects and A, B, E, J and P mounting brackets. 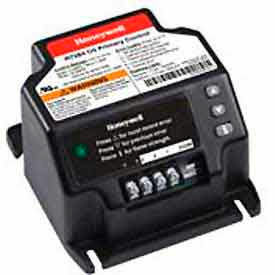 Honeywell Protectorelay® Oil Burner Controls Provide Automatic, Nonrecycling Control Of An Intermittent Ignition Oil Burner System. 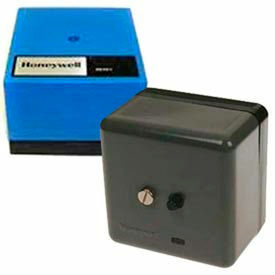 Honeywell Protectorelay® Oil Burner Controls are solidly made for long lasting durability and dependability. Control oil burner, oil valve and the ignition transformer in response to a call for heat. Solid state flame sensing circuit. LED for lockout indication and manual trip lever on safety switch assures burner shutdown during servicing. 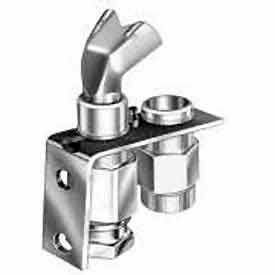 Mounts on a standard 4 x 4 inch junction box or directly mounts on burner housing. Choose from 15 and 45 seconds lock out timing. Model R8184G4082 includes remote alarm dry contacts. 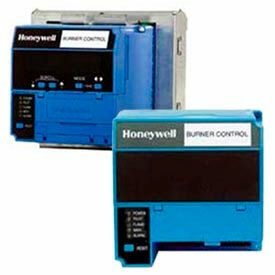 Honeywell Electronic Oil Primary Controls Offer Line Voltage, Safety Rated, Interrupted And Intermittent Ignition Oil Control For Residential Burners Used In Boilers, Forced Air Furnaces And Water Heaters. Works with both hydronic and forced air systems. Can fully integrate into any EnviraCOM™ communications system that allows remote monitoring with a simple 3-wire connection. R7284U1004 features a 16 character, easy-to-read two-line LCD display that provides cycle status, cad cell reading in ohms, baseline averages for cad cell and ignition time, error history, total burner cycles and recycle data. Directs technicians to the source of ignition failure when detected by the control. Select 15, 30 or 45-second safety timings. 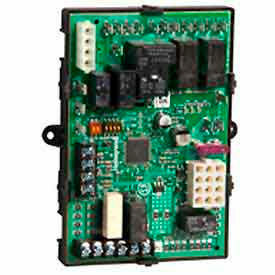 R7284B1024 has a single LED basic user interface that displays error codes and system status. 15-second safety timing.